Michael Blum proposes a critical and subversive (re)reading of major historical narratives. "His projects attempt [...] to confront the individual dimension with macro-economic and socio-political systems"1, most often using of overlooked characters or news items whose narrative he reappropriates by introducing new connections. 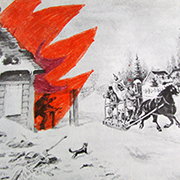 Two exhibitions held in Montreal in 2014 and based on recent investigations dealt, respectively, with the activities of Jacques Mesrine in Quebec (Guerre et paix, VOX) and with the question of the manifold Québécois and Canadian identities (Notre histoire || Our History, Galerie de l’UQAM). 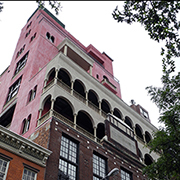 Palazzo Chupi, the installation presented at OPTICA, takes its title from a Julian Schnabel real estate project: in 2007, the American painter and filmmaker added seven stories in Venetian architectural style to a former stable that he occupied in Manhattan’s West Village. The artistic and commercial ambitions of this eccentric and controversial gesture were ultimately curtailed by the building’s gaudy aesthetic and the 2008 financial meltdown. Blum created Palazzo Chupi the same year, while living in New York. It is being shown here for the first time. Beyond its interrogations of urban gentrification, the preservation of architectural heritage, or the dynamics of rampant speculation in the financial sector and art market, the exhibition invites spectators to "pass through the image", figuratively and literally speaking, while demonstrating that history, like all narratives, is a construction. Palazzo Chupi articulates several elements, including a video presentation of 21 drawings attributed to Sherwood Darnell, a man who once occupied a prison cell that faced the site on which this palazzo now presides. His drawings depict the location’s evolution, from the beginning of time to some point in the distant future. Not only does this new body of work testify to the evolution of the West Village—replacing a linear conception of time with its cyclical representation—it also reveals a singular, and heretofore unknown artistic itinerary. Darnell thus serves as a foil to the famed Schnabel (conspicuously absent here). The parallel history on which the exhibition sheds light appears ultimately to crystallize in an exhibition space divided into two distinct areas, the one public, the other hidden, a spatial dichotomy that prompts us to explore the hidden side of things. 1. Corinne Charpentier, « Nowhere Better Than This Place », La dernière brève. [Online] Frankfurt: Revolver Verlag, 2005, p. 13. http://blumology.net/ccharpentierF.pdf. Accessed on December 20th 2014. The exhibition Palazzo Chupi is the object of the article "De la décoration comme art" written by Nicolas Mavrikakis (Le Devoir, February 21, 2015). Éric Clément also wrote about the exhibition in his article"Édification partielle" (La Presse +, February 25, 2015). Michael Blum is an artist using a variety of media, ranging from photography and video to books, installations, and printed matter. His work has been shown at numerous venues including the Centre Georges-Pompidou (Paris), the New Museum (New York), transmediale (Berlin), Kunsthalle Vienna, Museum der Moderne (Salzburg), De Appel (Amsterdam), the San Francisco Art Institute, the Baltic, Istanbul, Torino and Tirana Biennials. He is a professor at École des arts visuels et médiatiques, UQAM, since 2010. TOUT FAIRE PÉTER! MAKP wants to turn it all upside down, raze everything. Like the primitivists, he cries out, Zerstörung ist ein Anfang!1 But what is destruction the beginning of? No matter: BANG! You’re dead, and the rest of us with you. Why reflect on history when we’ll be blown to pieces with it? What remains of it, and us—limbs, flesh, carcasses, bone and architectural structures, "anarchitectures", vehicles, sports, Tarzan, PET, and everything it represents. Really such a pretty sight? At least we die in style. To die in style, just because it’s beautiful when it explodes. Just for that. For that only. All the sacrificed symbols, because "in the heat of the action, actions often outstrip one’s thoughts" (Socrates screaming behind the players' bench at the end of the second period). To see it all blow sky high and, just before it collapses, to rejoice. If we’re going to go down with history, 'might as well finish with a splash, for our own sakes as much as for Madame Lemay, of Saint-Hyacinthe. After all, they say violence is a big draw (Socrates is still bawling). After all, there will never be enough November 5s to fill all the killing fields (in the alchemy of writing, the meaning of this passage was destined to drown in history, exploded in "la bière du chien à Molson". With something of the prowess of a Gaétan Boucher or Nadia Comăneci, MAKP sketches out the edifice’s pending collapse, the collective heart of history pounding against its frame, on the brink of destruction. Not just any history: our history, writ both large and small. Will anything remain after the collapse? There will be some kind of follow-up to write, on what, of our beauty, may have survived intact. And the delirious crowd will cry out, misquoting Yvon Lambert, "that violence is at the root..." (still that other guy's beer). It’ll be Byzantium’s big comeback. Roublev, fear in his bones, fists raised before Lambert at the white line; Brunet at the centre of the ice, as the referee dives into the fray. Game’s end: I forgot! Of what, precisely, was the destruction the beginning? In the end, with the shards of our exploded heart, we’ll have to find what to say, what to do, what to write: it’ll be the start of another history, parsimonious, one hopes, in its austerity. 1. Our translation: "destruction is the beginning". Alexis Desganés lives, reads, writes, photographs, and loves in Québec. The exhibition Études préparatoires. Dessins d’explosions 2012-2015 is the subject of a short article : "Marc-Antoine K. Phaneuf : Images du passé actualisées" written by Nathalie Parent (Vie des arts, February 5, 2015). Éric Clément also wrote about the exhibition in his article"Édification partielle" (La Presse +, February 25, 2015). The team of Formule Diaz, a program broadcast on the channel Télé-Québec, came to film an interview with Marc-Antoine K. Phaneuf in our gallery space (Télé-Québec, Season 1 / Episode 21 / 05:35). As part of OPTICA’s educational program, Marc-Antoine K. Phaneuf will met up with 5th and 6th graders at Saint-Enfant-Jésus elementary school in the Mile End. Schoolchildren participating in the project will visit the exhibition with the artist in attendance and explore the creative process through a workshop given at their school. The works the students will produce during the workshop will be presented at centre OPTICA’s new AGORA space. The students will exhibit their masterpieces at centre OPTICA's new AGORA space from March 9th to the 21st. There will be an opening on March 9th from 5 PM to 7 PM. Artist and author Marc-Antoine K. Phaneuf lives and works in Montréal. He has presented his work in many artist-run centres, galleries, and museums in Québec and has published three books of poetry at Le Quartanier. On Family Saturdays, you and your children can discover Marc-Antoine K. Phaneuf's new exhibition entitled Études préparatoires. Dessins d'explosions 2012-2015. During the visit, children will learn about the artist’s creative process while sharing their thoughts with our mediator in a friendly atmosphere. Afterward, you’ll be invited to rumage through books and magazines, find images and directly modify them, using drawing to accentuate their graphical composition or narrative potential. Discover a new way of making images speak by creating your own story! 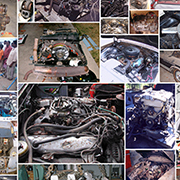 Start the workshop anytime you want, and take all the time you need to finish your work. 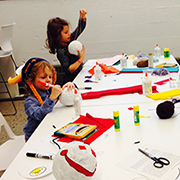 Creative family workshops will be held on the Saturdays from January 31st to March 21st. The mediator will be offering the workshop from 1 PM to 4 PM. As part of OPTICA’s "Artists in the Schools" Program, Marc-Antoine K. Phaneuf met up with 5th and 6th graders at Saint-Enfant-Jésus elementary school in the Mile End. Schoolchildren participating in the project visited the exhibition with the artist in attendance and explored the creative process through a workshop given at their school. The drawings and poems the students produced during the workshop will be presented at centre OPTICA’s new AGORA space from March 9 to 21, 2015. OPTICA's educational program is supported by the ministère de la Culture et des Communications and the City of Montreal (as part of the Entente sur le développement culturel de Montréal), and the Caisse Desjardins du Mont-Royal, Caisse Desjardins de l'Est du Plateau, and Caisse Desjardins des Versants du mont Royal. This lecture stems from a collaborative research that pans through various notions of projection. It was conceived in January 2013 by Kaya Behkalam, Azin Feizabadi and Jens Maier-Rothe, and for the first time presented in the form of a lecture at the Video Vortex #9 Conference at Leuphana University in Lueneburg, Germany. Points of departure are the philosophical and psychological facets of the term projection, alongside its associated cultural practices and their political dimensions. Shuttling between the interstices of 'reality' and 'fiction' the research framework aims to connect different historical events and movements, including various cinematic and political activist approaches since 1945, with the manifold spatial and temporal interfaces they have brought to light. Having started in Cairo on the second anniversary of the so-called Arab Spring, the point of view for this collaborative research is persistently defined by the lens of a specific time and place in which it began. © Sophie Castonguay, Isegoria, 2011. Performance avec récitants | Performance with reciters. Avec l’aimable permission de l’artiste | Courtesy of the artist. Photo : Simon Gosselin. Polyphonies is an exhibition that stages a plurality of voices while bringing together the work of eight artists including two duos. 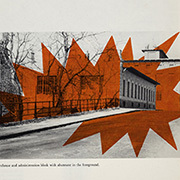 Whether based on documentary approaches (interviews, surveys) resembling anthropological field studies or revolving around the invention of fictional situations in which archives of various kinds are played out, the orchestration of speech in the artists’ propositions creates a disjunctive gap with the documented reality. 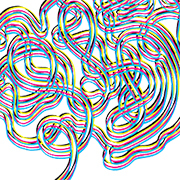 They appropriate ways of telling stories (in past, present, and future tenses) to bring out issues in the ideological and identity-related constructions that take shape through speech. 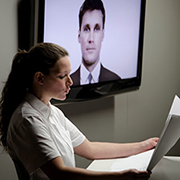 The performative installation project Penser le futur (2013-2015) developed by Anne-Marie Ouellet (Québec) rearranges the results of a survey conducted among 187 people about their general views on the future. By manipulating the responses given her, Ouellet interrogates the mechanics of polarization and normalization that take effect in manufacturing public opinion. Produced in collaboration with a small group of the regulars and personnel of a neighborhood bar, Québec artist Emmanuelle Léonard’s La taverne (2015) features a succession of individuals addressing the camera. Their preoccupations and opinions inscribe the expression of personal experience into the social life of the milieu while situating the protagonists between marginality and the stereotypical. In the video Don’t Do It Wrong (2007), Katarina Zdjelar (Serbia/the Netherlands) examines the moment during which, every morning, schoolchildren sing the national anthem at the beginning of the day in an Istanbul primary school. While the pupils’ arrangement in rows suggests a “collective body” in which the individual is at one with the nation, the children’s behaviour is constantly fracturing the unity that is being imposed upon them. The video installation The Negociation (2010), jointly produced by Kaya Behkalam (Germany/Egypt) and Azin Feizabadi (Iran/Germany), observes the conflictual relationships that develop between members of a group discussing their conceptions of revolution. 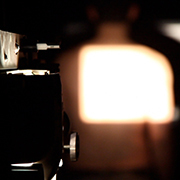 In a dual projection, the actors’ voices alternate with the voice of a narrator while also interacting with visual and textual elements that influence the discussion. In a kind of narrative stratification, this work examines representation, the reinterpretation of recent history, and the development of an imaginative world. With La part du lion (2015), Sophie Castonguay (Québec) convenes spectators to an unfolding, multivalent discourse set before a series of paintings created by her peers. Performed by a reciter and asserting the role of language in the very act of perception, the work places the visitor in a zone of uncertainty between a painted and a projected image, between the visible and the sayable, in short, between that which is present and the meaning created in a given situation. 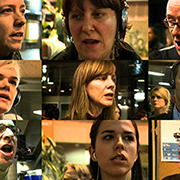 Dinner Party (2011-2015), a participatory project by Dave Ball and Oliver Walker (United Kingdom/Germany), calls upon eight characters who’ve never met and who accept to take part in a “mediatized” discussion around a meal served by the artists. 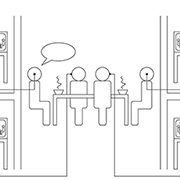 Four of the guests, concealed in various rooms, use phones and earpieces to animate the discussion of the other four, who are seated at the table in main room. 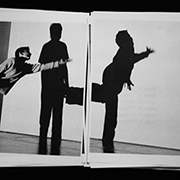 Recreated in Montréal, April 15 to 22, 2015, the experience interrupts the usual modes of socialization by decoupling verbal and non-verbal forms of communication. Built as polyphonic structures or using polyphony as a method, the works in the exhibition sound out the complexity of relationships between individuality and community. Each of the works establishes a discursive space in which personal conviction, belief, and individual experience encounter social and institutional spheres. From standardization to dissent, from subjection to self-determination, and especially in the constant negotiation between these extremes, the works all refer to the makeup of public and political spaces and to the conditions of possibility for living-together. In accord with their polyphonic dimension, the exhibition proposes to envisage these works as so many “voices” from distinct social, political, and historical contexts, reverberating in one another and resonating with shared, more global preoccupations. Concerned with notions of belonging, difference, representation, normativity, and sharing, they interrogate the power relationships that are established through language, along with the process by which identity-related and ideological constructs take part in articulating shared life and experience. Jérôme Delgado, 2015. « Parler de toutes les voix », Le Devoir, February 5. Web, "http://www.ledevoir.com/culture/arts-visuels/437707/parler-de-toutes-les-voix". Marie-Gabrielle Ménard enterviewed Véronique Leblanc at the program Montréal s'expose on CIBL, Sunday May 10th 2015. Dave Ball was born in 1978 in Swansea (UK). He lives and works in Wales and Berlin. Oliver Walker was born in 1980 in Liverpool (UK). He lives and works in Berlin and Liverpool. Kaya Behkalam was born in 1978 in Berlin (Germany). He lives and works in Berlin and Cairo. Azin Feizabadi was born in 1983 in Teheran, Iran. He lives and works in Berlin. Sophie Castonguay was born in 1974 in the Montréal region. She lives and works in Val-Morin and Montréal. Emmanuelle Léonard was born in 1971 in Montréal, where she lives and works. Anne-Marie Ouellet was born in 1982 in Rimouski. She lives and works in Montréal. Katarina Zdjelar was born in 1979 in Belgrade. She lives and works in Rotterdam. Véronique Leblanc was born in 1982 in Jonquière. She lives and works in Montréal. Véronique Leblanc is a Montréal-based curator and writer. She has curated shows featuring the work of Artur Żmijewski (Poland), Paul Wiersbinski (Germany), Dave Ball (UK), Jean-Pierre Aubé, Patrick Beaulieu, Douglas Scholes, Jean-Pierre Gauthier, and ATSA (Canada), among others. Awarded the John R. Porter Prize in 2015 for her essays on Emmanuelle Léonard and Artur Żmijewski, she participated in the first M&M Curatorial Research Residency Program in Mexico in 2013 (Oboro, Montréal / Laboratorio Arte Alameda, Mexico City) and in the CALQ Research residency for independent curators at the ISCP in Brooklyn in 2014. Leblanc has an MA in art history from Université du Québec à Montréal, where she now teaches. Anne-Marie Ouellet, Penser le futur, 2013-2015. Installation performative. | Performative performance. Penser le futur stages a bureaucratic space the narrative potential of which is generated from two “newspapers.” In the performance, the artist transforms the context described within these documents into a conversation between two protagonists and an avatar on the future of public, home, and political spaces. Dave Ball & Oliver Walker, Dinner Party, 2011-2015. Projet d'art vivant participatif. |Participatory Live Art Project. Dave Ball and Oliver Walker invite you for an early happy hour to participate in a structured discussion about their Dinner Party project. 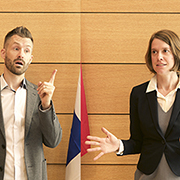 You will accompany ex-participants in creating a lively debate about some of the issues thrown up by the project. Kaya Behkalam & Azin Feizabadi, The Negociation, 2010. Image extraite de la vidéo. | Video still. The exhibition Polyphonies brings together works based on participatory and performative processes generated by a variety of voices. Curator Véronique Leblanc offers a guided tour articulated around the role played by printed documents in the works of Kaya Behkalam and Azin Feizabadi, Katarina Zdjelar, and Anne-Marie Ouellet. Arkadi Lavoie Lachappelle, Just Care, 2 août 2015. Performance dans le cadre de l'événement ACTES DE DISPARITION // en réaction à la destruction d'Agora de Charles Daudelin. Avec l'aimable autorisation de l'artiste. Photo: Christian Bujold. Colloque codirigé et modéré par Marie-Ève Charron, Marie-Josée Lafortune et Thérèse St-Gelais. Since Archi-féministes! : Le colloque is presented as part of a French congress in Montréal, the written communications were not translated in English. Inscription obligatoire pour assister au colloque. Des frais d'inscription sont requis. Le colloque se compose de contributions présentées sous la forme de communications orales et de manifestations artistiques. Elles aborderont, entre autres, la discipline de l’histoire de l’art et sa construction, lesquelles ont été maintes fois interrogées à l’intérieur des engagements féministes. Compte tenu d’un regain d’activisme dans les pratiques féministes contemporaines qui s’exprime, par exemple, par l’entremise de travaux de couture ou de tricot, elles commenteront également cette réappropriation d’un savoir-faire longtemps confiné à l’espace privé et domestique, redevenu porteur d’enjeux identitaires et de discours féministes transformés. La résurgence du féminisme sera enfin examinée à travers les pratiques qui persistent à faire résistance et qui obligent à revoir les déterminismes sociaux. Nous souhaitons surtout présenter des regards originaux sur les savoirs et les modèles d’actions féministes en privilégiant un contexte interdisciplinaire et la mise en avant de certaines innovations conceptuelles et méthodologiques qui résultent d’un maillage entre interventions théorique et artistique. Ces interventions témoigneront des modèles d’action d’ici, soulignant la réalité propre au territoire québécois. Il importe dans ce colloque que la parole soit donnée à des chercheur-e-s mais également à des artistes, les deux statuts se confondant parfois dans l’activisme de leurs positions féministes. Le travail d’appropriation fait partie des stratégies de prédilection des artistes postmodernes. À partir d’œuvres qui utilisent ce procédé (Sherrie Levine, 2fik, Mickalene Thomas), j’entends poser les bases d’une réflexion épistémologique sur le caractère normatif de la discipline de l’histoire de l’art. Surtout, mon intention est ici de réfléchir à la position de l’historien.ne, et à une possibilité de construire une pratique radicale de l’histoire de l’art. Pour ce faire, j’utiliserai les écrits d’auteur.e.s qui, dans la foulée de Michel Foucault et de Monique Wittig, ont formulé des critiques queer des disciplines normatives (Judith Jack Halberstam, Lee Edelman, José Esteban Muñoz, Elisabeth Freeman). Il s’agit d’une présentation-performance où je compte tirer les cartes devant public à partir de mon jeu Vie d’Artiste afin d’aborder divers aspects de ma pratique et de mon engagement en tant qu’artiste. Le récit se construira au fur et à mesure et au hasard des cartes tirées, entrainant des récits divergents, des dialectiques imprévues, des rencontres fortuites entre les idées suggérées par les cartes. Je suivrai également ce protocole pour répondre aux questions de l’assistance. Quand l’artiste canadienne Joyce Wieland s’est tournée vers des questions féministes dans les années 1960 et 1970, les résultats artistiques ont souvent pris comme point de départ la tradition des courtepointes et de la couture en général. Récemment, Cynthia Girard a créé des bannières qui font référence aux œuvres de Wieland, tandis que l’engagement politique de l’artiste montréalaise est ancré dans un contexte contemporain. Le lien entre ces pratiques artistiques nous permet de nous demander comment un discours féministe peut être repris et transformé. La Centrale Galerie Powerhouse propose une plateforme pour les artistes en arts actuels qui entre en dialogue avec les féminismes. À la lumière de la dernière publication de la Centrale, Impact féministe sur l’art actuel - La Centrale a 40 ans, un recueil de textes et d’images d’artistes et de chercheures qui réfléchissent sur les années d’engagement du centre, nous nous questionnerons maintenant sur les nouvelles formes de résistance, de féminisme et de mobilisation. Nous observerons notamment les transformations et les nouveaux paradigmes dans lesquels s’inscrit le centre et examinerons certaines démarches de membres artistes en regard de leur réalité et de leur engagement politique et social. Arkadi Lavoie Lachapelle : Foyers en irruption, Femmes en feu : Je m'aime comme je jouis, mais qui jouis-je? Pourquoi avons-nous la nausée lorsque nous lisons le nom du restaurant Ma grosse truie chérie ? Pourquoi ça semble si rassurant pour notre beau-frère de prédire que nous serons enseignantes en arts plastiques au primaire ? Pourquoi les blagues sexistes et misogynes entendues à la Ligue d'improvisation nous ont fait rire ? Savions-nous que la chasse aux sorcières était un des business très lucratif à la Renaissance ? Pour toutes ces questions, un réseau complexe d'hypothèses, de gestes et d'actions ; dans le discours senti, chante l'espiègle tambour : «Un bon, cunni, jamais ne sera vaincu !» Et sa puissance des tremblements. Le point de départ de mon intervention sera une actualisation du féminisme séparatiste de Carla Lonzi (1931-1982) critique d’art, puis féministe dans l’Italie des années 1960-70. Je voulais proposer une lecture transversale de ses textes à travers un regard rétrospectif susceptible d’en mettre en évidence les croisements entre les domaines de la politique, de la subjectivité et de la créativité. Carla Lonzi, qui abandonne la critique d’art pour le féminisme, choisit de se séparer (du monde de l’art, de la culture patriarcale) afin de se constituer en tant que sujet. Décrit en tant qu’irruption imprévue dans le continuum de l’histoire de l’oppression de la femme, le sujet féministe s’articule pour Lonzi à une dimension collective. Son intérêt constant pour l’art et la créativité s’exprimera tout au long des années 1970 par la tentative d’inventer des formes de vie et de créativité alternatives, dont on essayera de mettre à jour les résonances avec les problématiques qui traversent les luttes féministes contemporaines. Le Mois de la Photo à Montréal presents, in partnership with OPTICA, centre d'art contemporain, Top Secret. The Stasi Archives by Simon Menner. Are archives the bastions of power? On January 15, 1990, hundreds of enraged citizens stormed the headquarters of the Stasi – the sinister secret police of communist East Germany – managing to stop the destruction of a large portion of its archives. Their action saved millions of files, photos, films and recordings, which have requests for consultation that are still running at approximately 5,000 a month. Simon Menner has explored these archives, which would undoubtedly have thrilled Foucault. For two years, Menner concentrated on seeking out materials related to the themes at the heart of his work: observation, surveillance and camouflage. The images he found were unremarkable in appearance, but horrifying or hilarious, depending on the mood of the spectator, or whether or not he or she had suffered at the hands of the Stasi. Some were training materials for spies, showing them how to give coded signals; others documented covert searches, recording the placement of objects so that they could be replaced in the exact same position; and others still bore witness to the agents' transvestism, and the disguises and characterizations they could adopt in order to go unnoticed. Decontextualized, which is how Menner organizes these series of photographs, Top Secret: Images from the Stasi Archives (2011–13), may seem like a cross between Hans-Peter Feldmann, Sophie Calle and Cindy Sherman, with the corresponding questions regarding clarification of authorship, availability, appropriation and story. It also illustrates how the trivialization of evil, analyzed so profoundly by Hannah Arendt, can be exposed by bringing to light the neglected residue of a much-abused memory. MOEDER, Claire, 2015. « Le Mois de la Photo à Montréal, Centre Clark, Occurence, Optica, Parisian Laundry», Esse art + opinions. Web, "http://esse.ca/fr/le-mois-de-la-photo-montreal-centre-clark-occurence-optica-parisian-laundry". Simon Menner was born in 1978 in Emmendingen; he lives and works in Berlin. He holds a master’s degree in fine arts from the Berlin University of the Arts (2007), and has exhibited his works in solo and group exhibitions in various art institutions and festivals, such as the Arbeit Gallery in London (2015), the Goethe-Institut in Prague (2014), the Copenhagen Photo Festival (2014), the Museum of Contemporary Photography in Chicago (2014), the Open Society Foundation in Washington, D.C. (2014), the Grand Palais in Paris (2013), the Aperture Gallery in New York (2013), and the Grand Curtius in Liège (2013). He has received many awards, such as the Working Grant from the German Kunstfonds Foundation in 2014, the Lotto Brandenburg Photography Award in 2011, and the Paul Huf Award in 2010. 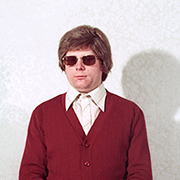 His publication Top Secret – Images from the Stasi Archives was nominated for the First PhotoBook Award by Paris Photo–Aperture Foundation in 2013. Le Mois de la Photo à Montréal presents, in partnership with OPTICA, centre d'art contemporain, The World as Will and Representation by Roy Arden. In 1818, Arthur Schopenhauer published The World as Will and Representation, considered the most fully developed manifestation of philosophical pessimism. For Schopenhauer, knowledge of what the world is and means can only originate in aesthetic experience. We are slaves to our desires, to the blind will to live – “Life is a torment and an opaque yearning” – but we have art to help us overcome it. Aesthetic contemplation detaches us from the endless chain of needs and desires. The kaleidoscopic flow of The World as Will and Representation – Archive 2007 (2007) embraces the most varied manifestations of life, and combines an almost exhaustive repertoire of random inclusions that leave us mired in surprise and confusion. What may seem to be a celebration of encyclopedic knowledge and the triumph of the culture of the archive in fact reveals the subordination of any will for classification and knowledge to the poetic imperatives of chance. Roy Arden was born in 1957; he lives and works in Vancouver. He had solo and group exhibitions at the Equinox Gallery in Vancouver (2015), the Monte Clark Gallery in Vancouver (2013), the Smithsonian Hirshhorn Museum in Washington, D.C. (2013), the International Center of Photography in New York (2013), La Alhóndiga in Bilbao (2012), the Vancouver Art Gallery (2012, 2010, and 2007), the Fotomuseum in Antwerp (2012), Les Rencontres d’Arles (2011), and the Centre de la photographie Genève (2010), among others. His works are part of public collections, such as those of the Canada Council Art Bank in Ottawa, the Centre Pompidou in Paris, the Hammer Museum in Los Angeles, the Musée d’art contemporain de Montréal, the Museu d’Art Contemporani de Barcelona, and the National Gallery of Canada in Ottawa. He is represented by Monte Clark Gallery in Vancouver. Images invade our world and our everyday lives. 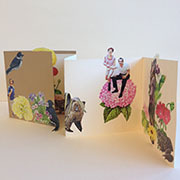 Come to classify and contain them in an artist’s book made by you! Internationally renowned Vancouver-based artist Roy Arden present works at OPTICA that highlight the omnipresence of images in society. 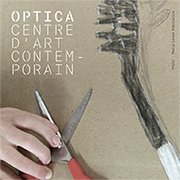 We invite families to discover his exhibition and approach to art in the company of OPTICA’s cultural mediator. Children will then continue their foray into the world of contemporary art time during a workshop in which they will associate images according to a chosen theme and make an artist's book showcasing their collection of images. You can start the activity when you want and make the artist's book at your pace. Circuit photographique, salon de lecture et sucreries! Participez à une visite interactive des expositions photographiques, présentées dans quatre centres d’artistes du Pôle de Gaspé, autour du thème de l’image. En parcourant le circuit accompagné d’une médiatrice, vous découvrirez des œuvres dans une ambiance chaleureuse et animée. Un salon de lecture pour petits et grands ainsi que des surprises à grignoter vous attendent à la fin de l’expédition. Vous découvrirez pour l'occasion quatre expositions présentées en partenariat avec Le Mois de la Photo à Montréal. Point de rencontre : Centre CLARK, 5445, avenue de Gaspé, espace 114. 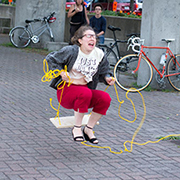 In the run-up to the 2015 federal elections, OPTICA, centre d'art contemporain is collaborating with independent candidates and professional artists Chris Lloyd (former Conservative candidate) and Kim Waldron to organize a debate to which all candidates in the Papineau riding are invited to participate. Art critic and journalist, writer for Le Devoir newspaper, Nicolas Mavrikakis will moderate the debate. Part of VIVA! Art Action’s off-site programming, this event will take place in a professional environment, very much like a regular televised debate. Candidates will be invited to rethink the limits of our democratic institutions and to re-imagine how we are governed. Culture will obviously be a major consideration, but other issues will also be raised. - Advocate for more voices in government through election reform. - Empower women to seek leadership roles and strengthen social programs that encourage the equality of women. - Make culture a priority and improve the art industry with tax incentives that are internationally competitive. - The environment should shape our economic policies in order to address climate change. - Simplifying the immigration process for family members of Canadian citizens. - Diminish the gap between rich and poor. - To make art and the environment genuine priorities. - For electoral reform and proportional representation. - To reform a system that privileges partisan politics. - To limit the powers of the PMO. - To end the over-compensation of MPs (if elected I will donate half my MP's salary -- $83,700 per annum to community organizations in Papineau). - Send a clear message to Ottawa: only a free and independent voice can truly represent Papineau! Débat introduction 1/6 from Lotus Productions on Vimeo. Débat art et culture 2/6 from Lotus Productions on Vimeo. Débat économie 3/6 from Lotus Productions on Vimeo. Débat environnement et science 4/6 from Lotus Productions on Vimeo. Débat réforme des institutions 5/6 from Lotus Productions on Vimeo. Débat égalité des droits entre citoyens 6/6 from Lotus Productions on Vimeo. FORTNER, Anderson, 2015. « Two Works in Progress : Chris Lloyd and Kim Waldron», Blog VIVA Art Action!. Web, "http://vivamontreal.org/en/two-works-in-progress-chris-lloyd-and-kim-waldron/". Born in Saint John (NB), Chris Lloyd graduated from the NSCAD, Halifax (NS), and has resided in the Papineau riding since 2007. With a politically oriented art practice, Lloyd has been working on the project Dear PM, since 2001, which involves writing daily to the Prime Minister of Canada. Kim Waldron is a Montreal-based visual artist who frequently uses self-portraiture to engage with contemporary social situations. Over the years, while addressing the role of images and the importance of context, her artwork has depicted how we construct reality. She was the recipient of the Claudine and Stephen Bronfman Fellowship in Contemporary Art and Pierre-Ayot Award in 2013. How do we generate intensity in a world swamped with images, with second- and third-hand imagery, in a world that has itself become a simulacrum? This question drives the work of Nicolas Lachance, who summons the device of painting while subjecting its components to a rigorous process of compression and accumulation. He uses the very techniques that lie behind the exponential proliferation of images—prints and transfers, layered lamination, piled sediments—to create particularly dense tableaux, a profusion of condensed stratifications. Yet Lachance subtracts as much as he adds: he exhausts the pigment, sands the layers of paint, wipes all surplus to the point of opening up the weave of the canvas; he cracks through the wall of the invisible to extract a single image from it. Extraction means labour. The image’s appearance here never registers as the epiphany of revelation, but proceeds, rather, from a logic of perspiration. Skin is what the over-consumers of images see with today—at times by effect or consequence, through nebulous attention or peripheral sensation; at others by pressure, friction, or some stubborn attachment—such that images infiltrate and suffuse us through every pore. As such, what the artist offers us is an image that is itself emulsified and exuded, its contact contagious, corrosive by design, in its inscription both of the traces on the canvas and of the image on our retinas. 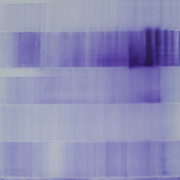 In his recent works, Lachance examines the replication of the image. He culls motifs from the world of infinitely reproduceable images, like the backs of laminated posters, finds unearthed from thrift stores, or archival photographs recovered from the dustbins of memory. These motifs are then reworked, not as subjects for representation but as fragments of time or natural inscriptions to be interpreted, much like a divinatory reading of the stars, stones, or the flight of birds. 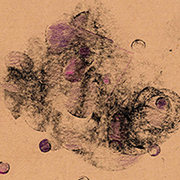 The monotony of shaded monochrome (dust painting, transfers from carbon paper to canvas) renders the ambiguity of the image and reveals its palimpsest body, activated like a skin, a membrane permeable to affective proliferations. Ji-Yoon Han is pursuing doctoral studies in art history at Université de Montréal. As part of OPTICA’s educational program, Nicolas Lachance will met up with 5th and 6th graders at Saint-Enfant-Jésus elementary school in the Mile End. Schoolchildren participating in the project will visit the exhibition with the artist in attendance and explore the creative process through a workshop given at their school. The works the students will produce during the workshop will be presented at centre OPTICA’s new AGORA space. The students will exhibit their masterpieces at centre OPTICA's new AGORA space from December 12th to the 19th. There will be an opening on december 15th from 6 PM to 7 PM. Since 2014, Nicolas Lachance has exhibited his work at the Darling Foundry and at Galerie René Blouin, which represents him. He garnered an Honourable Mention at the 2014 RBC Canadian Painting Competition. He lives and works in Montréal. Martin Leduc is an artist of sound and of the moment. A Montrealer hailing from Île Perrot, Leduc draws inspiration from observing and listening to the cycles of nature, such as the steady yet ephemeral modulations of wind in the leaves or on the surface of water. As in his previous work, Cordes proposes a reflection on our relationship with the sound environment through a constantly renewed, infinitely variable auditory excursion. 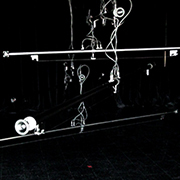 Suggestive of eolian phenomena, this kinetic instrument spatializes sound progressions that are constantly modified according to the movements it generates. As in the Heraclitean river that one cannot enter twice1, Cordes is a stream of sound that offers an entirely different listening experience at every audition. Leduc proposes to discover other listening potentialities in situ, beyond the framework of recordings, performances, and sound synthesis. He invites audiences to a perceptual and sensory experience. He offers us a now all-too-rare and often neglected time-space of respite. Cordes thus becomes the tamed echo of a breath of nature, an in situ aside in the urban bustle, the fertile humus of reflection on our sound environment, a sound that marks the body as well as the mind. 1. Pradeau, J. F. (2004). Héraclite, Fragments. Paris : Flammarion, p. 102. 2. Debray, R. (2000). Introduction à la médiologie. Paris : PUF, p. 17. Louise Mongeau studied social anthropology and ethnomusicology in Paris and in Montréal and social communications in Brussels. Poirier, Josianne (2016). «Martin Leduc : L'espace de la rêverie», Espace art actuel. no. 113, spring-summer, pp. 95-96. Martin Leduc is completing a doctorate in art studies and practice at Université du Québec à Montréal. At the same time, he studied in electroacoustics at Université de Montréal. He draws inspiration from and appropriates various concepts and theories, especially the autopoiesis of Francesco Varela, the stochastics of Iannis Xenakis, Bernard Stiegler’s general organology, and Régis Debray’s mediology. He has presented his work in Brazil, in the United States, and in Québec, at the Jardin de Métis, among other venues. In his new exhibition, Montreal painter Nicolas Lachance traces the shades and vestiges of spare, subtle imagery. We invite you and your family to join our cultural mediator in discovering the artist’s work. You will also have an opportunity to leave your own traces by taking part in our workshop, an introduction to the basics of printing on paper. With carbon paper as your main material, you will employ drawing, colour, cut-and-paste, and scrubbing to create an abstract image. The workshop is open to the whole family and will run continually from 1 pm to 4 pm Feel free to join in at any time. Saturdays November 21st and December 12th. As part of the program Artists at School developed by OPTICA last year, Nicolas Lachance has worked with fifth- and sixth-grade school children from elementary school Saint-Enfant-Jésus (Mile End). They visited the exhibition of the artist at OPTICA in his company and took part in a creative workshop led by the artist at their school. The artworks created by the students under the supervision of Lachance are exhibited at OPTICA in the AGORA space from December 12 to the 19th.